This is a fact of nature that we are well aware of and for this reason, the team at Unique Services operate on a 24 hour basis, ensuring we are on board when you need us most. For a valued client this ‘open all hours’ access came into play early one week day morning. 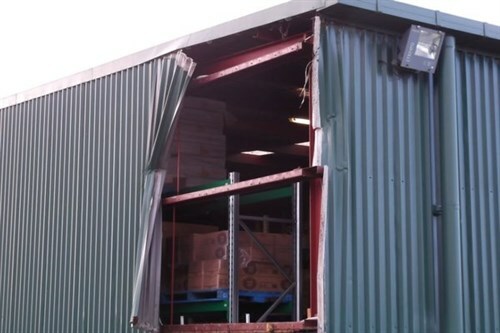 We received the call that a container truck had reversed down an access way with its hydraulic arms extended. 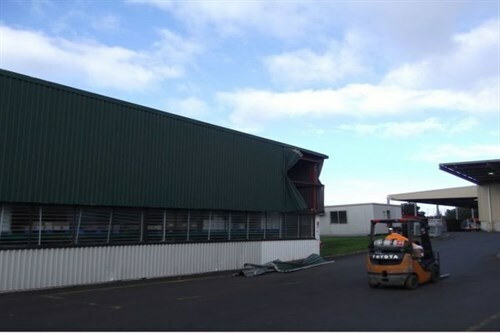 The result of this extra wide load was serious damage to the iron sheeting of the exterior of a raw material storage warehouse, leaving it open to the elements and exposed for birds, insects and rodents to enter. Not a good situation to be in when you are a cereal manufacturing company. A Unique Services representative was dispatched and on site within 35 minutes of the call (that’s a quick response time, even by the highest standards). Once onsite, an overview of the damaged area revealed exposed and hanging live wires, in contact with the steel frame of the building. The now slightly stressed client was made aware of this serious hazard immediately. A quick phone call had an electrician on site to isolate the energy source and make the damaged area safe for work and repair. Six full sheets on two walls of the exterior of the building had been torn open by the wayward, wide extended truck. Basically peeling it open like a soft drink can – and now this new opening beckoned nearby birds with a keen sense of curiosity. They had begun to gather on the neighbouring rooftop, checking out the newly opened and exposed site which indicated yet another issue of concern, bird infestation. A team member was dispatched to collect temporary iron sheeting to seal the opening in the building. A sample of the old sheeting was taken with them to be manufactured and colour matched for permanent repairs at the earliest convenience. By now it was just after 9 am. The team had the old Iron removed by lunch time. By this stage, the temporary sheeting and fixing screws had been sourced and brought to site. Installation of the temporary repair began and well before the end of the day, the team had fully sealed the hole in the building. Site clean-up and checks were then carried out, making sure no tech screws or torn pieces of iron remained to give any nasty surprises at a later time. Nearing 5pm, after having our client view the repair with us and discussions of when a permanent repair could be made, the work area was dis-established, permits were closed off and our team headed back to the office, with the satisfaction a job well done, firmly under their belts. 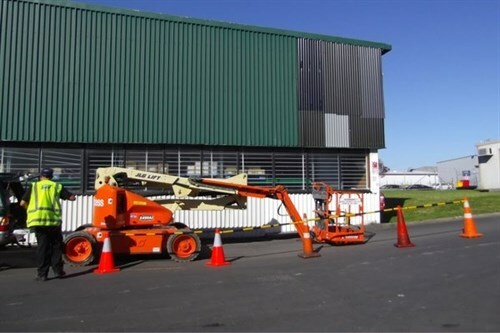 It is of great credit to the highly skilled staff at Unique services that the repair, from planning to completion was carried out in a fast and safe manner, with no loss of production. If you ever find yourself in a similar situation and need a rapid and well thought through response to any situation, give our team a call. Whether it is 6am or 6pm our team are prepared, focused and capable of pulling together an emergency rresponse to your business needs. We always say it, but our work tends to represent it best – “Unique teamwork brings unique results”.